Hi-Protein Dosa made with wonder grain Quinoa and pulses (dal). 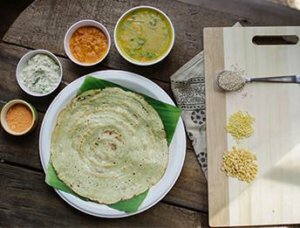 Quinoa Dal Dosa is a ready-to-cook dosa mix which is convenient to prepare. It contains the wonder-grain Quinoa and nutritious legumes arhar, urad and moong dal. Quinoa is a nutrient-dense food containing protein & several other nutrients. Legumes are source of protein and fibre. This makes Quinoa Dal Dosa a perfect alternative to traditional white rice dosa. 1. The product is packed with the goodness of protein and provides most of the essential amino acids. It also provides energy needed to carry out different functions. 2. Dals have resistant starch which acts like fibre in the body and helps control blood sugar levels, aids bowel movement, and helps in weight loss. 3. The Quinoa Dal Dosa contains high protein that helps in digestion. Plant proteins are digested slowly which keeps you satisfied longer so that you can cut calories. 4. Urad dal is rich in iron, folate, fibre, potassium. It is also a good source of calcium, which is important for vegetarians and elderly people who require high amounts of calcium for maintaining bone health. 5. Quinoa is a traditional gluten-free seed which was celebrated as a wonder-grain by old civilizations because of its unique nutritional profile. 6. Quinoa has a high protein content, higher than other grains (>14% protein, while rice has ~7%, millet ~10% and wheat ~13%.). The protein quality is unusually superior, making quinoa a complete protein and its essential amino acid balance is similar to milk.